2012 Riesling Grand Cru Wineck-Schlossberg from Jean-Marc and Frédéric Bernhard Not even Alsace wines can prevent that life interferes with updates of this website. To return with a Wineck-Schlossberg feels natural. The first years I contested, against better judgment, if Wineck-Schlossberg could give great wines. Today I know better. Bernhard, Meyer-Fonné, Paul Blanck and Clément Klur make Wineck-Schlossberg that go straight to the heart. Just as the producers themselves. 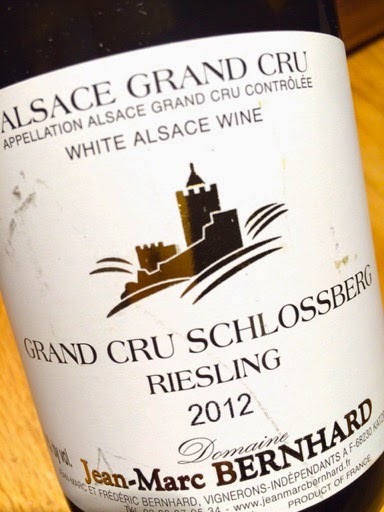 2012 Riesling Grand Cru Wineck-Schlossberg from Jean-Marc and Frédéric Bernhard has a deep greenish-yellow color, typical of the vineyard. The fragrance begins to develop with yellow apples, honey, wet stones, orange and straw. The palate is medium bodied with a nice attack, ripe and tasty fruit, delightful acidity and a wonderful granitic salinity in the dry aftertaste. Thank you, dear friends! Price (2015): € 14.